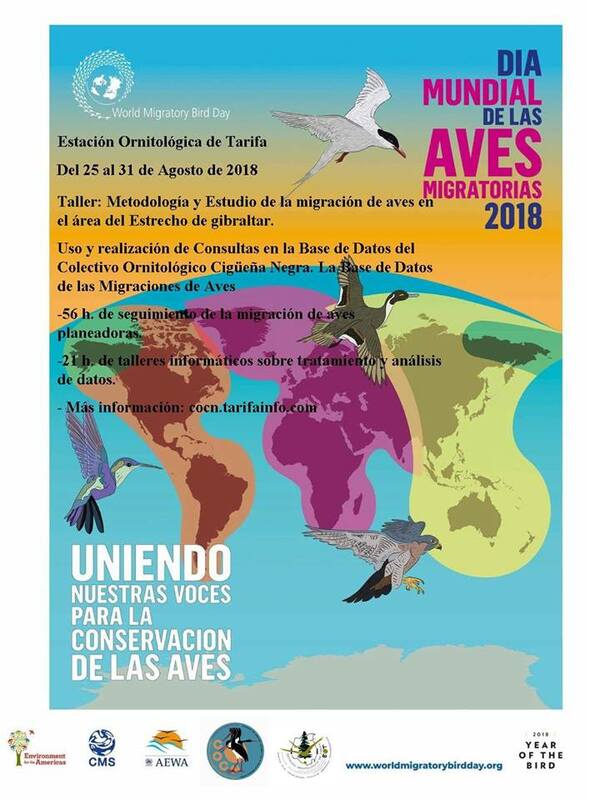 Workshops on Methods and Study of the migration of birds in the area of ​​the Strait of Gibraltar. This summer we conducted 2 workshops on Methods and Study of bird migration in the area of ​​the Strait of Gibraltar. Both are taught from the Ornithological Station of Tarifa by volunteer staff with more than 20 years of experience in this field. And they are courses for a maximum group of 6 students. – Censing of gliding birds. – 56 h. of tracking of the migration of gliding birds. Participants are offered accommodation at the Ornithological Station of Tarifa. Volunteer insurance, trips in the area, kitchen with utensils, guides and bibliography. Participation certificate and personalized tutorials until the end of 2018 if the student finds doubts during the months following the completion of the course. With this course the students will reach a Level C Level or higher (Depending on the use they have already made of the computer systems of the association) – Coordinator of the working group> 2000 observations processed in the Bd of the Cocn. and at least 25 observation periods performed. Which enables him to offer courses and training at levels C and D (See final table). € 60 Members of the COCN. 105 € Non-members. For the members, they must send the participation form along with the bank receipt indicating the COCN 2018 partner share. People who are thinking of partnering should do this process before next July 5. In order to give them time to send their membership receipt well before the start of the course. Members must not make any payment. Only authorize the association so that the amount of the course registration can be charged from your bank account. Formation levels on Bird Migration in the COCN. – Level D – Volunteers observation of birds -> 500 observations processed in the Bd of the Cocn. – Level C – Coordinator of the working group -> 2000 observations processed in the Bd of the Cocn. and at least 25 observation periods performed. – Level B – Shift Coordinator in the Migratory Census in the Strait -> 2500 observations in the Bd of the Cocn. 50 observation periods carried out, at least 15 of them in the Strait and course carried out on volunteer management in the COCN. – Level A – Project Coordinator in the Migratory Census in the Strait -> 5000 observations in the Bd of the Cocn. 50 periods carried out in the area of ​​the Strait, publication in the section of the Bd itself of at least 3 analyzes or articles with information on the system and course carried out on volunteer management in the COCN. – Important Note: This course is taught by volunteers of the association with extensive experience on this subject (Level A). Any economic resource obtained from this course is used for COCN volunteer projects. and maintenance of the Ornithological Station of Tarifa.